On one of my long lunch breaks I visited my favorite furniture store, hhstyle. There’s nothing in there that I can afford. Even the little toy models of the furniture range in the $300-500 range. But all the pieces are at least intrigueing works of art, if not beautiful. They may even be comfortable but I’ll never know because there are DO NOT TOUCH signs everywhere. I see the shop, located in Harajuku, as more of a museum and I enjoy the interior layout of the showroom itself, which features long glass enclosed staircases that span the length of the building, leading to the different floors. If you want service you’ll have to go up to them; they do their best to try to pretend you’re not there. 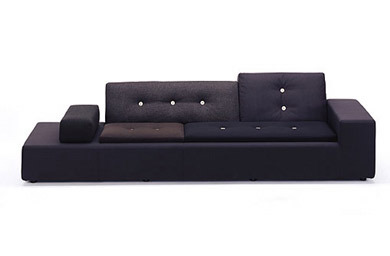 If there’s one piece that I would entertain buying (once I win the lottery) it’s the Polder Sofa. The designer, Hella Jongerius, is a Dutch furniture designer, fabric artist, and ceramicist. She took inspiration from the drained lowlands of the Netherlands, which are called ‘polder’ in Dutch. In fact, you can see the patchwork farmland that the sofa represents with the five matching colors that comprise one sofa. My favorite is the green, but the grey one pictured is more striking. The horizontality of the sofa also represents the wide flat plains of the polder. The attention to detail is both whimsical and refreshing. 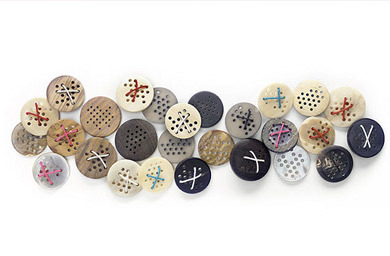 The buttons, for instance, are made of varied materials, including bamboo, buffalo horn, and mother-of-pearl. The picture cannot capture how invitingly warm the sofa is in real life. The unusual but generous proportions embody what she writes as “form follows feeling”. Like surveying pleasing famland, gazing at the sofa produces a feeling of serenity and calm. The Polder Sofa is a welcome contrast to the trend towards sparse, ultra-modern, cool designer furniture that has prevailed since the 90’s. Rather than just creating a primarily functional, design-driven piece of furniture, she strives to imbue her creations with a sense of personality, of having a history. Here she describes the importance of story in design. HELLA At least your colleagues give you flowers when you have something to celebrate. That never happens if you’re a designer. Who’d want to ruin a perfectly good vase by putting flowers in it? LOUISE Yes, artists get flowers, and then they just grab the nearest pot or bucket to put them in. But it’s noticeable that the people who design vases never get flowers. So why do designers design vases? HELLA Because of the ‘stories’ they tell. Vases were originally meant to be used, of course, but like any useful object a vase has a potential that goes beyond functionality. The story can rise above the object itself. LOUISE Then you’re talking about art. HELLA No, I’m not talking about art. Useful objects have a rich history. They are saturated with references to specific contexts and specific moments in history. If you refer to that history explicitly, and include all the associations in a new story, then you are communicating something – and it’s something about useful objects. Hella’s newest works, including a smaller version of the Polder Sofa, will be exhibited from November 3-7 at hhstyle. Hi Wind! I like this entry as well. I studied architecture because of this kind of thing. I enjoy beauty in all it’s forms.